Most people would say that worry and anxiety are perfectly normal, and that there’s absolutely no way we can live without worrying or being anxious about day-to-day life issues. They would say that worry and anxiety are a normal part of life. The truth however is that it is indeed possible to live without worrying or being anxious, but it’s only possible if you are located where Jesus is, if you’re consciously living in the spirit and in the light of God’s Word. I’m not saying that there aren’t things to potentially worry about, there are a plethora of things to worry about if you choose to. What scripture teaches, however, is that instead of worrying and fretting there’s something else we should do. You’ve got to respond to life’s issues and challenges somehow, so if worrying is alien to the higher life we’ve been called to live then what are we supposed to do? When faced with life’s problems and challenges, our response should be to turn to our Father in the first instance, not as a last resort. We should turn the issue over to Him in prayer and trust that He has it sorted out. If you dwell in the sense realm, living by what you can see naturally, you will never be able to do this. It will be impossible for you not to panic when faced with issues if you are a carnal or body-ruled christian. It is only if your spiritual senses are keen that you would be able to see that God is working things out in your favour even when all you can see looks nothing like it. The key therefore, to being able to live a worry-free life is to live a spirit-controlled and Spirit-filled life. That’s when you will be able to pray and give thanks rather than worrying. That’s when you will be able to sense God’s peace in your heart even in the face of fierce storms. Paul understood this well; remember how he had absolute confidence that he would survive a storm at sea because he saw beyond the obvious. Remember how Elisha was at peace even though surrounded by armed soldiers because he could see into the spirit realm. In the same way when faced by circumstances, rise above the things your physical eyes can see and look to the spirit. What you see will cause God’s peace to fill your heart making you immune from the anxiety-inducing thoughts the enemy shoots at you. Worry and anxiety may be words in the dictionary, but they should not exist in your vocabulary as a believer. When an opportunity to worry presents itself, take it as another opportunity to see God come through on your behalf. When next you face a pressing financial need that looks like it will sink you, take it as a chance to see Psalm 23:1work for you. If you ever get a frightening report from the doctor, take it as a chance to see 1 Peter 2:24 displayed in your life. Nothing you will ever face will shock God or cause Him to panic! Imagine God running around and saying “I don’t know what to do, my child is sick”! That’s totally impossible. Be like your Father and banish worry from your life. Since He said you should not worry it implies He’s given you the ability because God never asks us to do what He hasn’t empowered us to do. Strive to live above anxiety, worry or fretting. 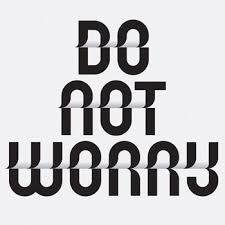 Our God doesn’t worry and neither should you! Today is a gift don’t let it go to waste.